A CMS vendor is challenged to honestly answer all items on the "Reality checklist for vendors" suggested by CMSWatch's Kas Thomas (aka the "we-get-it checklist for vendors"). If possible the vendor has supply screenshots, links or other means to make it easy to verify the answers. The answers also need to be supplied in a short form of one to three stars (denoting "no", "sort-of", "yes"). Answering all questions on his blog allows the vendor tag some other WCMS vendors. A tagged vendor should provide a link back to the blog that tagged him. Yes, download the EE trial and you can choose between various bundles meeting your needs, including an installer. All files are installed in a single folder, no additional software except Java is needed. To uninstall either use the uninstaller installed by the installer, or simply remove the folder. You can chose the installer language, but the default locale when you start up Magnolia is English. You can change that in the user preferences for each user separately, so if you have a globally distributed team speaking 15 different languages, no sweat. Not only eval versions, but even completely functional versions are available from Magnolia - a free trial of a complete Enterprise Edition or a completely free Open-Source Community Edition is available for immediate download. Oh yes. And not only is it a sample site, it is a a production-ready, search-engine-optimized, accessible site that works on any browser. CSS driven. XHTML. State of the art. We provide all documentation online, including a 300 page user manual. No registration required. Yep, link to our issue-tracker is right in AdminCentral. 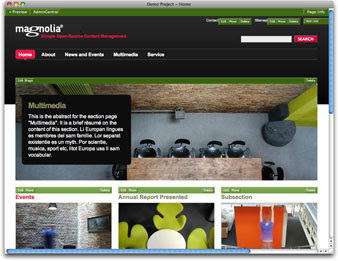 All Magnolia documentation is online. Link is right in AdminCentral (see above). As a side-note, I don't think it is a great idea to deliver documentation directly with the product, because it bloats the download and is outdated before it is read. Nearly. Unlike Day, we did not have three years time to release our latest generation of software, and since we just released Magnolia 4.0 last week, I am afraid we did not have time to upgrade our site yet. We'll do it as soon as we have managed to call back all those prospects that inquire about us these days. Salespeople? That's a bit last century, no? But the people you talk to know how Magnolia works, because the people you talk to are the people who developed it. Of course. We tend to say less and let the software speak for itself though. Of course not. 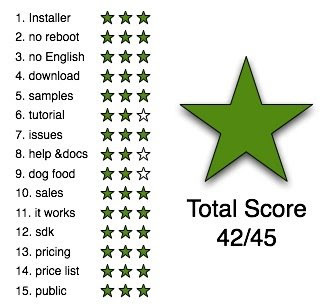 We don't even charge for the software unless you want our supported Enterprise Edition. Yes, and Magnolia prices are published on the web. We do give discounts to non-profits and educational clients, though. ... and we are always happy to talk to you on the phone or in person. Do you ever buy bottled water?